A street view of Seventy Damansara – one of the new projects in Damansara Heights. Located up in the hills amidst quiet surroundings and just minutes away from the Kuala Lumpur city centre, Damansara Heights is easily one of the most exclusive neighbourhoods in the Klang Valley. It helps too that there is not a lot of vacant land up for sale there, making for a very much sought after address for property investors seeking good resale value. “The scarcity of land within the Damansara area definitely adds to the appeal of Damansara Heights. There is a lot of supply there but its mostly within the secondary market,” Landspecs principal Chan Khay Eng tells StarBizWeek. In Chan’s opinion, land being limited in supply does appreciate over a length of time in value, but adds that this applies to all landed properties everywhere. “However, new landed developments tend to have a significant influence on existing property prices,” he says. Chan says sellers of landed properties in Damansara Heights often compare prices of their properties to newer gated developments such as those in Sri Hartamas, Desa ParkCity and Damansara Utama. According to him, the transacted prices for bungalow lots are averaging between RM300 per sq ft to RM380 per sq ft. For newer areas such as Setiabakti and Murni, prices average between RM600 per sq ft to RM630per sq ft.
For detached and terrace houses, transacted prices start from RM400 per sq ft while semi-detached homes start from about RM500 per sq ft. Chan says the prices of the homes however depended on various factors, such as location, condition and quality of building. On iproperty.com, Damansara Heights is described as a panoramic township that caters to the high-end demands of Malaysians and expatriates of all walks of life. “With its first class facilities, restaurants serving international cuisines and a trendy nightlife, Damansara Heights is considered a prime location due to its easy accessibility from the city centre and Petaling Jaya. “From Bangsar, Jalan Maarof smoothly connects to Jalan Damansara, while Jalan Duta and Jalan Semantan provide excellent accessibility to Damansara Heights for those coming from the North-South Highway,” the website says. Given its exclusivity and prime location, land value in Damansara Heights has been on a steady incline in the past two years, says Zerin Properties chief executive officer Previndran Singhe. “Land values on average (in Damansara Heights) are about RM450 to RM700 per sq ft. Prices have appreciated since early this year by a good 5% to 10%. Since 2008, prices have increased 15% to 30%. Prices are definitely higher than Bangsar for detached homes and semi detached units, but terrace homes in Bangsar are more pricey than those in Bukit Damansara and Medan Damansara. For condominiums, Damansara Twins is the newest and is higher than Mont’ Kiara and in tandem with KLCC and Bangsar high-end condominiums,” he says. Over the years, there has been talk that some areas within Damansara Heights have started looking a little run-down. Despite the scarcity of land in Damansara Heights, new projects would help to rejuvenate the area. One of them is Panareno Sdn Bhd’s Twins @ Damansara Heights. Other projects which have helped to add interest in the area are newer developments like Seventy Damansara and Idamansara, both by the Eastern & Oriental Bhd group and Anggun, a project by L & H Property Development Sdn Bhd. Twins @ Damansara Heights is a condominium development that starts from RM675,000 and Anggun consists of bungalow homes that range from RM6.5mil to RM9.5mil. Previn says new projects in the pipeline would have short-term impact and in the long-term, could lead to an increase in traffic flow. Steven, a real estate agent from Rina Property, says prices of residential homes within the Damansara Heights area had appreciated between 10% and 20% in the past two years. Mah Sing Group Bhd, the country's fifth largest property developer by revenue, is in talks with the government and private land owners to buy land in the Klang Valley, Penang and Johor. Group managing director Tan Sri Leong Hoy Kum said the company is on an aggressive land acquisition trail. For government land, Leong said Mah Sing is open to cooperation with relevant government-linked companies, but he declined to disclose the name of the company it is talking to. "We are confident that we will lock in more land soon. We do not want to miss the chance to buy government land, more so with the mass rapid transit (MRT) project that is coming up. "There are also many government projects being tendered out from now until the middle of next year ... so we must get ourselves ready to capitalise on the opportunity," Leong said. The three-line MRT project, costing more than RM30 billion, is to improve public transport in the Klang Valley. Mah Sing has RM300 million cash in hand, some of which will be used to buy land. By early next year, it expects to receive RM215 million from the sale of an eight-storey building to Koperasi Permodalan Felda Bhd. "We have enough funds," Leong said yesterday after the company's extraordinary general meeting in Kuala Lumpur. Mah Sing has 21 ongoing projects worth RM6.3 billion in the Klang Valley, Penang and Johor. It is planning 10 more projects, expected to be launched from year-end. Among them are Kinrara Residence, a RM830 million medium- to high-end housing development in Puchong, featuring 836 bungalows as well as semi-detached and super-link homes. Leong said he is confident the company's sales this year will surpass the RM1.5 billion mark, due to strong numbers already locked in from its balanced and diversified property portfolio. Up to July this year, it had raked in RM1.02 billion. Leong also said that he is bullish on the property market for the next one to two years. "We should not worry too much about over-heating. We are promoting Malaysia 'My Second Home' scheme in China, Singapore, Hong Kong, Taiwan and Europe. Some 10 per cent of foreigners contribute to our sales and we expect more going forward," he said. Mah Sing also hopes the government will further open up its policies to encourage foreigners to buy properties in Malaysia, especially those in the high-end segment, he added. PETALING JAYA: High-end properties, especially condomimiums costing RM1mil and above, are still enjoying good sales backed by favourable financing, although some buyers are turning cautious in anticipation of upcoming budget measures to cool the property market. “Currently, we do not feel there is pull back on banks in financing for high-end projects and the property overhang in this sector is not as serious as perceived,” Real Estate And Housing Developers’ Association Malaysia (Rehda) president Datuk Michael Yam told StarBizWeek. Under this category, there may be some high-end properties in Mont’Kiara, KLCC and possibly, some condo projects in prime areas located in Penang and Johor. However, Yam pointed out that this small high-end segment should not be overlooked. “This high-value property segment can have a significant impact on economic growth. The economic stimulus vis-a-vis the Economic Transformation Programme are critical to the future vibrancy of this segment,” he said. On the Government’s proposed deposit requirement on homebuyers to cool down property speculation, Yam said Rehda suggested that for the first and second properties, it would be better to allow the banks to assess the homebuyers’ financial position for deposit requirement on the property. Real estate property consultant Amy Chung, who focuses on high-end condos in the Golden Triangle area in Kuala Lumpur, said more locals were buying these condos, backed by access to financing and the rental market. “They mostly buy from foreigners, who are the first homebuyers, paying a minimum of 25% above the foreigner’s purchase price about one and a half years ago,” Chung said. However, the situation was different during the downturn when most of the buyers were foreigners. A property agent in the Golden Triangle agreed that the take-up rate for high-end condos was improving each year. She estimated the occupancy rates in various property projects as: K-Residence (less than 55%); Hampshire Residence (about 50%); Pavilion Tower 2 (30% to 45%); Marc Residence (70% to 75%) and Berjaya Times Square (90%). According to Chung, high-end condos in the Golden Triangle would sell for RM850 per ft to RM1,200 per sq ft. In Johor, developers are more worried if the ruling were to be imposed on the non-high end residential properties. “Buyers of high-end residential properties are those with money and coming out with 30% downpayment (should the property loans be capped at 70%) is not a problem to them,” Johor Real Estate Housing Developers Association chairman Simon Heng said. In Johor Baru, high-end properties comprised those just RM400,000 and above. Curbs on property loans are not likely to affect Singaporean buyers because of the strong Singapore dollar. “In fact for years, Singaporeans and foreigners taking up housing loans from local banks have only been getting 70% from the banks,” said Heng. 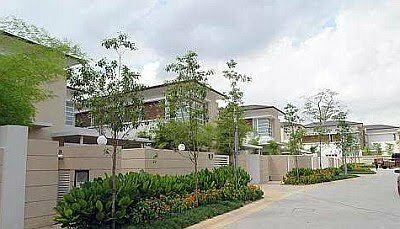 Berinda Properties Group sales manager Lim Sung Heng said demand for high-end houses in Johor Baru was good with many wanting to upgrade from mostly single-storey terrace houses. From Berinda’s experience, most buyers of its high-end residential properties paid more than 10% downpayment for their houses. Berinda’s projects in Johor Baru include Taman Molek, Molek Pine, Impian Molek, Molek Groover, Taman Redang and the houses are prices between RM500,000 and RM3mil. He said the property market there also benefited from Iskandar Malaysia due to rising demand for high-end residential properties in southern of Johor. In Penang, SP Setia property (North) general manager S. Rajoo said sales of high-end properties had increased in the past two to three months. Sales of SP Setia’s residential landed properties priced between RM647,880 and RM1.4mil had registered RM102mil in sales revenue over from July to August compared with RM60.4mil three months earlier. “The higher sales in the second half were mainly due to the introduction of the easy home ownership campaign where the buyer pays up to 3% down payment. Since the beginning of this month, sales have hit RM208mil,” he said. The bulk of SP Setia’s sales came from its Setia Pearl Island three-storey semi-detached houses which are priced from RM1.4mil onwards and Setia Vista double-storey houses which are going from RM647,880 onwards. IJM Land’s sales for July and August were about 40% higher than May and June. This was due to the launch of The Light Collection 1, comprising 176 units of condominiums and water villas, priced from RM800,000 to RM2.6mil. To date, IJM Land has sold about 60% of The Light Collection 1. However, a Penang-based valuer said investors were now taking a cautious approach when buying residential properties priced from RM1mil onwards. “They want to know more about the directions of the Government first before making further commitments,” he said. Another property consultant based on the island said there was a slow-down in the high-end property segment priced between RM600,000 and RM3.5mil. “This is due to concerns about the property market being over-heated. The forthcoming budget will have a lot of impact on the future trends of the property market,” he said. PETALING JAYA: The property market, especially in the Klang Valley and Penang, are showing signs of getting frothy, so much so that talks about higher tax on property gains are getting louder as Budget 2011 announcement gets nearer. Re-introduced earlier this year at the rate of 5% after a three-year hiatus, there are those who view that the real property gain tax (RPGT) should be implemented back on a original progressive scale where short-term gains are taxed the heaviest. But industry players, understandably, are not too thrilled about the prospect on higher taxes. “Personally, I don’t think the Government will increase it,” Master Builders Association of Malaysia (MBAM) president Kwan Foh Kwai told StarBizWeek in a telephone interview. “But you’d never know what will happen next week,” he said. The Government will table its Budget 2011 in Parliament on Oct 15. From the contractors’ point of view, Kwan said, a healthy property market would benefit the whole economy. “Prices had gone up in the past few quarters, but can be still considered relatively low because the market was stagnant in 2008,” said Kwan, who is a director at Sunway Holdings Bhd. OSK Research, in a recent report said one potentially negative news for the sector could come in the form of a cap on loan to value ratio. Such a move would probably be aimed at second or third home purchases, while first-time house buyers would probably be allowed to continue to borrow up to 90% of the property value. Meanwhile, Bank Negara had increased interest rate three times so far this year from a record low level. The Government re-introduced RPGT in the Budget 2010, but at concessional rate of 5% for disposal of properties held less than five years. I&P GROUP Sdn Bhd is taking advantage of the auspicious date of 10.10.10 to showcase 16 products worth some RM413 million during its MadAboutHomes2010 property bonanza tomorrow. “The long awaited terrace and semi-detached homes in Alam Damai and the shop offices in Bandar Kinrara and Alam Sutera will also be offered. We anticipate very good response from the public despite the present economic scenario,” managing director Datuk Jamaludin Osman said in a statement. The public will also have a preview of I&P’s 156-unit deluxe apartments in Bandar Baru Seri Petaling township with a project value worth RM150 million. ABU Dhabi's Mubadala Development Co's entry into an agreement with 1Malaysia Development Bhd (1MDB) yesterday to participate in developing a multi-billion-ringgit commercial project in Kuala Lumpur came some four months after the announcement on the collaboration was earlier planned. Mubadala yesterday said it is ready to participate in building the RM26 billion Kuala Lumpur International Financial District (KLIFD), an area designed to house all players in the financial sector. The development will take place on a 34.4ha site near Jalan Tun Razak in Kuala Lumpur, popularly known as Dataran Perdana. The collaboration was first scheduled to be announced at an event on May 29 this year, with the attendance of General Sheikh Mohammed Zayed Al Nahyan, the Crown Prince of Abu Dhabi, and Deputy Supreme Commander of the United Arab Emirates Armed Forces. However, on May 27, invited guests were notified that the event had been postponed. No reasons were given. But checks with the Kuala Lumpur Land and Mines office indicate that a tussle may have occured over the Dataran Perdana land. One of titles on the land states that Pelaburan Hartanah Bhd (PHB) (previously Pelaburan Hartanah Bumiputera Bhd) had placed a caveat on the land on May 7 2010, just 22 days prior to the event. PHB, set up following the tabling of the 2006 Budget, was said as being in the process of buying several prime properties, including Dataran Perdana. It was to issue capital market instruments, such as real estate investment trusts, in future to provide investment opportunities for Bumiputera investors. PHB, however, withdrew the caveat on September 20 2010, and on Monday, 1MDB itself placed a caveat on the land, indicating that it had been handed over to it for development of the KLIFD project. Valuers have put a price tag of RM400 to RM600 per sq ft for land around the area, putting commercial value of Dataran Perdana at between RM1.5 billion and RM2.2 billion. It was not clear whether PHB had paid for the land and Business Times has also not been able to establish if 1MDB has made any payment for the same property.